Enjoy warm floors in the winter, and never worry about having to shovel snow again. 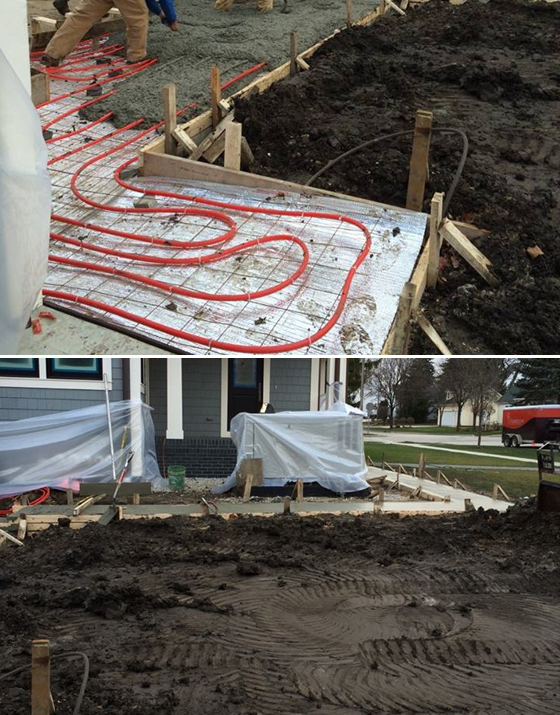 RPM offers state-of-the-art hydronic systems that are specially designed for your home's flooring and outdoor areas. With a radiant floor system, heat is dissipated where you need it, so the entire room is always warm. With a snow and ice melt system, shoveling snow and laying out salt becomes a thing of the past. The system melts the snow and ice, leaving your driveway and walkway clear and safe for driving and walking. In a perfect home, you could go barefoot in warm comfort—even in the winter. With a radiant floor heating system, this is possible. A radiant floor system makes any home comfortable and energy efficient. It ensures warmth throughout your flooring, whether ceramic, laminate, carpet, stone, or hardwood. It is energy efficient because when radiant heat is installed, it replaces your forced air as a primary source of heating, thereby saving you 10% to 30% of your energy costs. Moreover, it dissipates heat where you need it, whereas the warm air from a forced-air system rises to the ceiling, keeping the rest of the room cold. Never shovel snow again. With a snow and ice melt system installed under your driveway and sidewalk, you'll never have to wake up early to shovel the snow and chip away at the ice. It melts everything away, leaving your driveway and walkway completely cleared. Extend the system into your garage floor and use it as a primary source to heat your garage. It also works well under a brick patio, allowing you to entertain outside in the fall and even in the winter.